Ahhh enchiladas, the labor of love we all need to experience at least once in our lives. This isn't my first time making a batch from scratch, but it's certainly one of the longest and time-consuming. But in the end, you have a healthy, flavorful, unique twist on the Mexican classic that's sure to keep you satisfied for a few days. 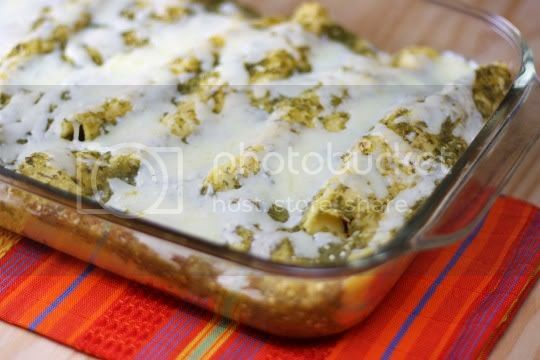 There are three major components to this recipe: making the sauce, roasting the vegetables, and building the enchiladas. That's the order of the recipe, but I actually will go out on a limb here and suggest that you roast the veggies first. They take a whole 50 minutes in the oven, so you might as well be doing other things during that time. So once you've got all the veggie prep done, this step is pretty simple. Toss chopped butternut squash, red bell peppers, and red onions with olive oil, cumin, coriander, and salt in a large roasting pan. Put it in the oven, bake, and stir occasionally. Oh, and at the end of baking, stir in fresh minced garlic (this way, it stays pungent and spicy instead of being roasted, mmmmm). Now, you can start making the sauce (and really, there's no rush here...you can always make the roasted veggies and sauce ahead of time). Besides this first step, it's super easy to make, as most of it takes place in a food processor. 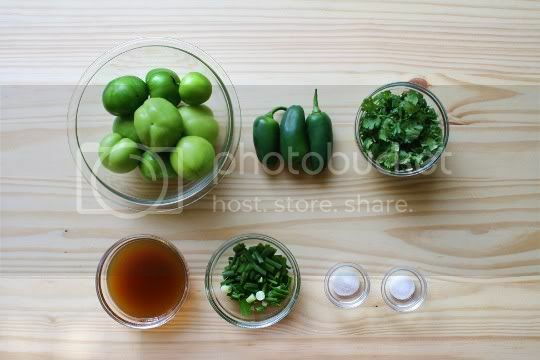 Carefully drop the tomatillos in boiling water, and boil until they start to lose their bright green color. This will probably take about 3-4 minutes for most of them, but a few may need to stay in longer. They should turn from a bright green to a pea soup color, and the texture should be like a ripe plum or tomato (firm, but yielding to pressure). Remove these using a slotted spoon, and let them cool while you're preparing the other sauce ingredients. Next, puree jalapenos in a food processor (really, I don't see why you couldn't just put everything in together, but whatever). Then, add the tomatillos, cilantro, vegetable broth, green onions, sugar, and salt, and whirl away. But be careful: doing something like this with hot items inside is a recipe for a kitchen disaster. So instead of putting the spout thing inside the top of the food processor, I just put a paper towel over it. This lets the steam escape, preventing any unexpected explosions. Anyway, puree this for a while until everything is saucy and slurry-like in consistency. Hey guess what, you've just made homemade tomatillo salsa! Wasn't it easy?! By now, your veggies should be ready, and you're ready to build the enchiladas. Warm the tortillas one by one in a skillet over low heat, just enough to make them pliable (corn tortillas are easy to tear, so be careful). Building them might be a little tricky, but after the first couple, you'll get the hang of it. 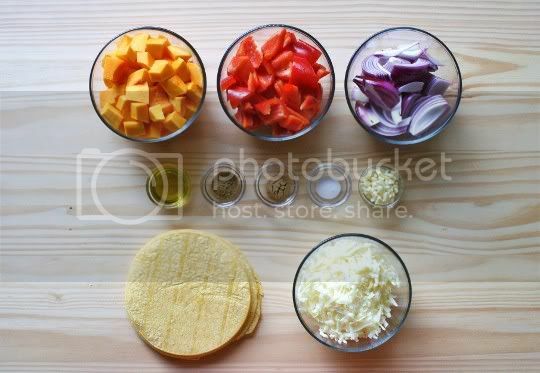 Put the tortilla in one hand, then spoon some of the veggies down the middle, then sprinkle on a little cheese. Carefully roll them, and place seam-side down in an oiled baking dish. Now, the recipe says you can fit 12 of these babies in a 9x13-inch dish, but I only got about 9. You don't want to roll them too tight, or they'll rip, but not too loose, because you want enough to fit. I'm guessing you'll get about 8 to 10 to work. When all the enchiladas are rolled, pour two cups of the tomatillo sauce over them (trust me, you'll still have plenty left over). Bake for 15 minutes, sprinkle on cheese, and bake again until melted. And then, you're ready to eat! Serve the remaining tomatillo sauce on the side. So how are these laborious little things? Pretty damn good. 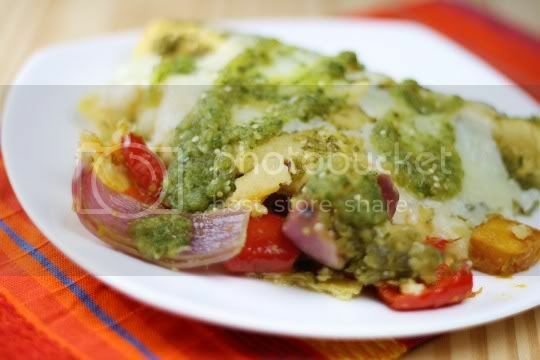 I'd actually say the star of these enchiladas are the roasted veggies, which are amazing on their own. They're prefectly seasoned, and the roasting really brings out the sweetness of all the veggies, not just the squash. They're so sweet, they're almost fruit-like, but that's where the salty cheese and tangy and cilantro-heavy tomatillo sauce make this a complete flavor extravaganza. While all of the flavors here are pretty light, this is definitely comfort food. Two of these are good for any hearty meal. Leftovers are good too... the tortillas do get a bit soggy from all the liquid in the tomatillo sauce, but it's a good thing: the enchiladas sort of turn into a tamale casserole. So hey, it's like two meals out of one! Vegan variation: Use vegan cheese. Um, YUM! 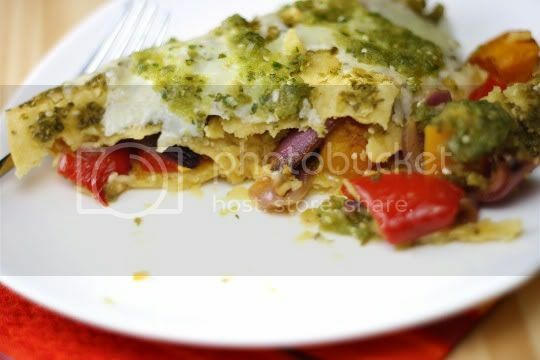 I adore roasted veggies, and I adore enchiladas, so what a great idea to combine them! This sounds so tasty, definitely have to try it sometime! 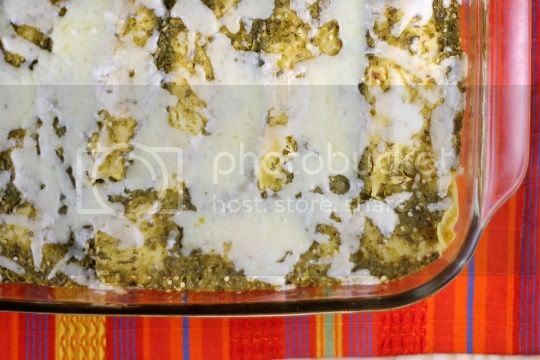 Enchiladas verdes are my absolute favorite! And these look yummy! Recipe looks great. How much stock did you use for the sauce? Check out the recipe link at the bottom of the post, all amounts and full instructions are listed there. Happy cooking! Link doesn't work anymore...do you still have recipe? Drat, looks like they've done a site redesign and changed all their recipe links!!!! Anyway, I've updated the post. Thanks for catching it! Thank You. Made this recipe before and turned out fantastic.